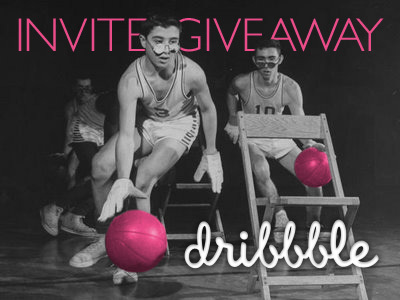 To celebrate my new website launch I have decided to give away two Dribbble invites that I received last month. For those that don't know, Dribbble is an exclusive community of amazingly creative people. I was lucky enough to have been invited a little over a year ago and the community has been a big influence in pushing me to be a better designer. Leave a comment on this post with a link to your portfolio, your twitter username and your Dribbble prospect account (if you have one). Tell me a little about you, what you’re doing, what you are working on, or whatever else you’d like to share. I’ll announce the winners on both Twitter and Dribbble in a week or so depending on the amount of comments/entries. Thank you to all the very talented designers who submitted their portfolios for an invite to the Dribbble design community. It was a very, very hard decision to make and the winners were announced on Friday, February 24th. Congratulations to both Luboš Volkov and Jesus Suarez, welcome to Dribbble! Hello ) my name is Leo, I’m typeface designer from Georgia, think reading my lifestory will boring 4 ya)) so I just want to tell that as much I create new letters there is always something new to create, and dribbble is something new for me now. I’m a Web UI Designer & Engineer based in sunny South Florida. When I’m not dodging hurricanes, I work on pretty pixels and code. I recently started noodling in making responsive websites (see port site). My name is jesus Suarez, I am a graphic designer and motionographer from Venezuela, but I am currently living in Orlando, FL. I’m about to get my second degree in Digital arts and Design from Full Sail. I found out about dribble a few weeks ago and I have to say it looks like a pretty useful tool to connect with other creatives and to get your name out there! I would love to receive an invite for Dribbble. I would welcome the opportunity of becoming a creative presence among other creatives, gaining even more knowledge & insight into excelling as a great designer. FYI…I’m also diggin’ your portfolio site - love the sticky nav concept! My name is Tim Smith. I am a passionate design student with a broad skill set. I am studying at Full Sail University and have experience with print design, web design, 3d arch vis, branding, photography, illustrations, motion graphics, etcetera. I am interested in a dribbble invite to grow my network of designers, receive feedback, and gain exposure. You can see some of my work on behance http://be.net/thesmithlab and http://vimeo.com/thesmithlab. My name is Jérémy Stenuit. I’m a student in Web Design & Multimédia at the Haute Ecole Albert Jacquard in namur (Belgium). I’m working on my portfolio which will be full responsive. It would be so great for me to be on dribble, I really want to be on it to share my work and have feedback from profesional. I’ll really appreciate if you give me an invite. I’m 20 years old graphic designer from Czech Republic. Design is my only passion for 6 years and i really need (want) to improve and i think only way how to do that is on dribble! Last words: i want to make everything different! Hi, I’m Luis. I would love to be a part of Dribbble because I love webdesign. I often add new features to my websites and themes or try around with CSS3. I’m also learning PHP at the moment and I already have some Ideas for a Wordpress theme, so I think this will be my next Project. Here are some links to things I did in the last time: http://www.luisgerhorst.de, http://beautifulweb.tumblr.com, http://cloudy.luisgerhorst.de & http://darkthings.luisgerhorst.de. I’m Gregory Baroin, a co-founder of C2 Studios. C2 Studios is a creative studio founded in 2011 resulting from the combination of three graphic designers: Romain Bordessoulle, Guillaume Guittet and me. We would like to share what we are currently working on Dribbble. I’d like to be invited to be a part of the dribbble community. I am a recently graduated student from California and I have been a prospect for a while and am inspired every day by the amazing designers on the site. If invited I promise that I will contribute positively to the community. I already spend a considerable amount of time on dribbble and would love to give and receive feedback as part of my daily ritual. I am currently freelancing as a UX Designer in the San Francisco Bay Area. Thanks for the consideration! Currently, I am a senior at Cal Poly San Luis Obispo studying art & design concentrating in Graphic Design. I cannot WAIT to graduate and work full time in the industry that I love. For the past few years i’ve worked on campus doing various graphic design for Cal Poly. but for the last 8 months I’ve been working at a digital marketing agency (Hathway) focusing on website design. It has absolutely opened my eyes to a whole new spectrum of design, that I will take with me through my career. I truly admire the work you create, (the detail in your user interface designs are awesome!) and I hope we can develop a networking relationship! I will definitely make you proud on Dribbble! Im a latin web designer based in Mexico City (Sometimes in Vienna). I am right now working as a UX/UI designer in an agency and I really REALLY love what I do. I have been doing websites since 2003. I will appreciate if you dice to give me an invite. P.D. you hava a cool portfolio and shots on Dribble! Keep with the good job man.